Think back to when you were about to transition from elementary school to middle school. Maybe you felt anticipation, curiosity and excitement, or apprehension, anxiety and fear – perhaps all rolled into one. Maybe you couldn’t wait to have a locker for the first time but worried about remembering your locker combination, or maybe you looked forward to more challenging classes but wondered how you’d fit in with your new classmates. Eventually you adjusted to the changes. Your child, too, may experience various emotions as he or she prepares to enter a new and bigger school. As a parent, you’ll want to help prepare your child before and during this transition, but you’ll also need to be prepared for some changes in your child. What changes might my child experience? Physical and emotional transformations. Around this time, most children will be in the beginning stages of puberty. In addition to physical changes, children may begin to have unpredictable mood swings and become more self-conscious and more sensitive. Academic difficulties. According to the American Psychological Association, academic difficulties are not uncommon and children may struggle academically in their first year. Parents may see a drop in grades or notice that their child is no longer as eager to attend school. Such changes could be due to a number of factors including increased competition, which can lead to lower self-confidence. What can I do if my child fears the transition? Visit the new school with your child. By visiting the school with your child, whether for a school orientation or by requesting a personal tour, you can help to build good feelings about the new school. In addition, you can also help to take away some of the fear of the unknown that your child may have. If possible, meet some of his or her teachers. Taking the time to visit the school before the first day can provide your child with a comfort level that he or she may not otherwise have. Discuss the changes. Be honest with your child about entering a new stage in life. Explain that other students will have the same emotions as well. Let your child know that you experienced various emotions, too, and that you are always available to answer any questions that he or she might have along the way. Encourage your child to try new things. In middle school, your child will have opportunities to meet new friends, join new clubs, and participate in activities such as a school sports team or school orchestra. If your child seems nervous at first, you can help alleviate those fears by explaining some of the wonderful benefits that can come from taking part in a new activity. Assure your child that what’s important is to do his or her best. Explain that it’s good to reach for the stars, to compete mainly against oneself and to always have goals. Explain, too, that one doesn’t have be “first,” that not everybody can be first, that people who are not “first” sometimes excel in unexpected and greater ways, and that it’s OK to fail. Make sure that your child understands that things don’t always go perfectly the first time or the second time and that failure is often the best way to learn. Finally, reassure him or her that you will always be supportive. Stay upbeat and positive. Children are quick to read emotions in others. If your child senses and sees in your demeanor and words that you have a positive and upbeat outlook, chances are that your child will pick up on this and feel soothed and inspired. 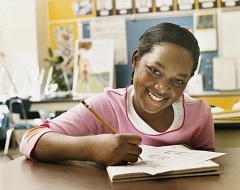 The transition from elementary school to middle school can invoke many emotions, so help your child learn to embrace it as an exciting time that can open many wonderful new doors.